I'm dropping out of the Split Ends Club and dropping into an 8:15pm hair appointment tonight at the Scott J Aveda Salon Spa (their name rings through my head b/c I used to call so much for bikini waxing appointments...no longer!). Ever since Anne Hathaway's bang in The Devil Wears Prada, I want my bangs back. 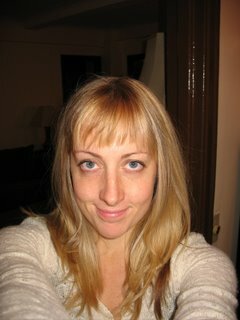 I'm over my swoop, no-bang look, so am looking for a new bang to hopefully give a little life to my just-got-out-of-bed-and-didn't-brush-my-hair look. Also, because of my roots, the new, undied pieces of my hair are healthy and limp. I need me some color damage to bring this droopy look some volume! Most of these pictures have brown hair...maybe I should get that too...? ?